What is the African passport? The idea behind the passport, which was launched this weekend, is for all African citizens to be able to travel throughout the continent without visas. There are two passports - one issued by the African Union for officials and people who travel a lot on business, and the other by individual countries for everyone else. It will bear the African Union's name and that of the issuing country. It is not known what a normal citizen's passport will look like. It is an attempt to ease movement of people across the continent and stimulate trade across the continent. This month Ghana introduced a new visa-on-arrival policy for citizens of AU member states. The Africa Development Bank report on visa openness found only 13 out of 55 countries allow all Africans to enter either without a visa or to get one on arrival. These kind of blockages hinder inter-African trade, which remains very low. Many countries still do more business with their former colonial power, than with their neighbours. AU Deputy Chairman Erastus Mwencha told the BBC that the issue of free movement had been "on the table" for 25 years. He believes that it is necessary for Africa to "harness" the talents, skills and labour of its population. At first it will be rolled out to African heads of state and top AU officials and foreign ministers. 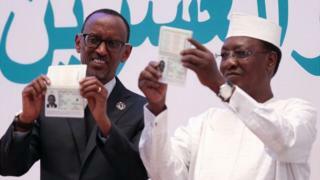 The first recipients were chairperson of the African Union Idris Deby and Rwandan President Paul Kagame. The ultimate goal is that all African citizens will be able to apply for an African Union passport. However, this still depends on countries passing the necessary legislation in their own countries. It is unclear if everyone who applies for a new passport will automatically get an African Union one or if you have to request one. It is also unclear if everyone will have to update their passport before travelling or if people will still be able to travel with their old passports. All the African Union has said is that individual countries will make their own decisions on issuing passports. Which countries will get them? All members of the African Union should get an African Union passport, provided they pass the legislation in their country. This means every African country apart from Morocco - although Morocco has just asked to rejoin the AU. When will people get them? Some heads of state have already been given an African Union passport. The full roll-out for African citizens is supposed to happen by the end of 2018. However, details of that roll-out are sketchy. One interpretation is that the strategy is not clear because the passport has been rushed through before all the necessary arrangements have been put in place. It is a biometric, or e-passport, that meets international standards and will be modelled on the European Union one. Mr Mwencha argues that they will be more secure than the current passports that are not biometric documents. The old passports, he says, are easier to forge. He told the BBC it will be easier to track criminals and terrorists. However, with all countries able to issue the passports, that means a lapse in a single country could affect the entire continent. Why not just change the visa system? It isn't clear why a reciprocal agreement among all African countries to allow each others' citizens through their borders without visas wasn't made instead. It is possible that this may be seen as more secure. The AU is also pushing for citizens of all African countries to be allowed to stay visa-free for 30 days across the continent, before the roll-out of the passports. AU Deputy Chairman Erastus Mwencha says not one country in the African Union has objected to the plan. So it only won't go through if parliaments block it. But again, the details of the plan are sketchy. However, many African countries might be reluctant to open their borders, fearing a huge influx of people from other countries. This might be especially true of South Africa, which currently hosts large numbers of migrants from across the continent, and has seen xenophobic attacks. Has there been any reaction? BBC Africa readers heavily criticised the initiative, on BBC Africa's Facebook page. Many argued that the passports should not be issued to the "elite" first. While others complained that it would have been cheaper to have an agreement about visa-free travel and that there were more important things to worry about. What other challenges are there to African trade? A big one is travel infrastructure. Many countries have more flights to London or Paris than with other countries on the continent. For example, there are very few flights between Abuja and Dakar - two major West African capitals - and passengers sometimes have to travel via Nairobi or Addis Ababa in East Africa, or even Europe. So even if the passport is introduced, a lot of work would still need to be done to make African trade easier.